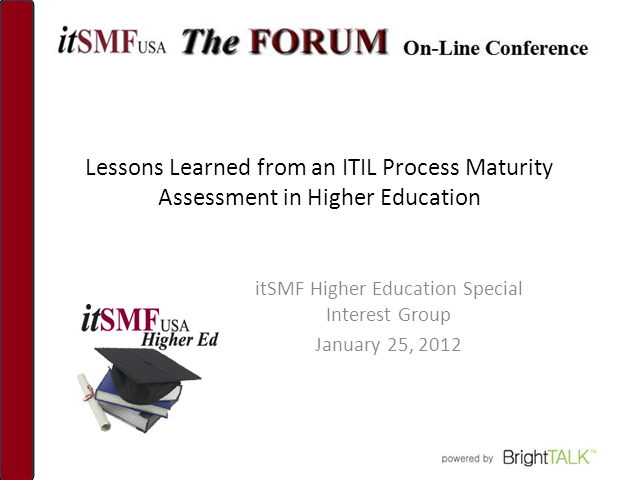 Attend this itSMF Higher Education Special Interest Group (SIG) webinar to hear Jim Haustein, Cornell Information Technology's Process Improvement Manager, describe their experience with an ITIL process assessment. Reg Lo, from Third Sky, will also present a short segment on TIPA(r), an internationally-recognized framework for IT process assessment. TIPA offers a turnkey, well-defined, repeatable methodology that organizations can perform themselves after being trained in the approach. Jim Haustein is Cornell Information Technology's Process Improvement Manager and is responsible for maturing and maintaining a portfolio of maintainable processes, to facilitate process and IT Service Management awareness, training and mentorship. Jim's experience in the private sector before coming to Cornell has proven to be a valuable asset for improving the efficiency and effectiveness of IT processes within the higher ed environment. He was a co-presenter at Educause 2008 and a reviewer for the 2011 ITIL Service Design book. Reg Lo is a certified ITIL v3 Expert and Vice President of Professional Services for Third Sky. Reg has helped hundreds of organizations adopt IT Service Management good practices. He recently spoke at the itSMF Fusion conference on "How to reduce IT costs and give the Business the levers to control costs"; and was also a speaker at the 2008, 2009, and 2010 conference. He was selected as a reviewer for the ITIL 2011 Edition and was also a reviewer for TIPA - an open framework for assessing ITIL and ISO/IEC 20000 maturity.